New screen and shade solution from the award winning design team at oceanair marine. 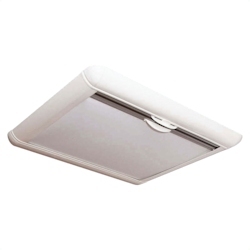 Combines a retractable hatch shade (with 100% blackout) and fly screen system (utilizing UV treated fiberglass mesh) in a low profile styled cassette. Includes easy to use and reliable magnetic handle system. Simple surface mount installation utilizing four corner radius system to provide a complete thru-deck finishing solution.